Mix the perfect Caribbean Mojito, using Mount Gay Rum, Schweppes Soda Water and our carefully composed infusion, The Secret Ingredient. Add hand-picked botanicals to flavour and colour the cocktail to your personal liking. To create the full sensational taste experience, enjoy the Caribbean Fruit Mix while slowly sipping from your Caribbean Mojito. Create a sensational taste combination by accompanying your Caribbean Mojito with the sweet and savoury Caribbean Fruit Mix. Mount Gay Rum is the oldest, most nuanced rum in the world. The complex flavours have been coaxed from natural Barbadian ingredients, the purest water available and by refining the crystallised sugar from sugar cane. Being part of their special Mixers’ Range, Schweppes Soda Water will sensationally boost your cocktail. A tropical mix of pine- apple, papaya and crunchy coconut cubes. Lemon peal and lime, indispensable when wanting to get a taste of the Caribbean lifestyle. 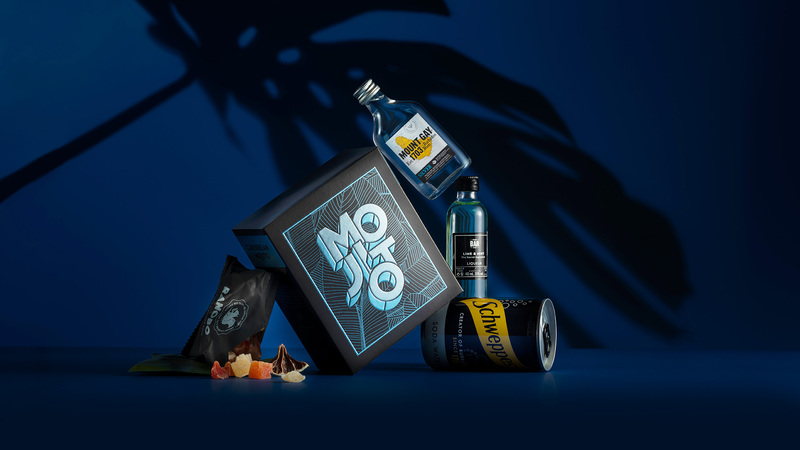 The Secret Ingredient: An exhilarating infusion, especially composed by MiniBarBox to shake the perfect Mojito.